A monk from Saint John's Abbey will give a free presentation at St. Scholastica examining how artists have tried to illustrate the sacred throughout the history of Christianity. The talk will include discussions of the Saint John's Bible, a contemporary expression of the word of God. The Rev. Eric Hollas will present "Making All Things New: The Saint John's Bible and the Legacy of Christian Art" at 7:30 p.m. Thursday, April 11 in the Mitchell Auditorium on campus. From the earliest centuries of the Christian tradition, artists have sought to interpret the sacred through their own creative perspectives. In that tradition stands The Saint John's Bible, a 21st-century endeavor to make the Word of God come alive on a page. Commissioned by Saint John's University and the monks of Saint John's Abbey in 1998, the Saint John's Bible was the first handwritten Bible to be published in 500 years. It features 160 illustrations by six artists, and 1,150 handwritten pages written by six calligraphers. St. Scholastica is hosting a Heritage Edition print during this academic year. During the fall semester, the Gospels and Acts volume was on campus. It was traded out for the Pentateuch during the current semester to give people a chance to experience a different book. It is usually available for viewing in the library on campus. For details and a schedule, visit css.edu/Bible. 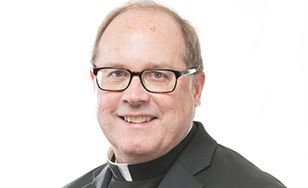 Father Hollas is a monk and priest of Saint John's Abbey, and has served on the faculty and staff of Saint John's University in Collegeville. He received his bachelor of arts in history at Princeton University and a Ph.D. in medieval studies at Yale University. He served from 1993-2001 as executive director of the Hill Museum & Manuscript Library, and he has been involved with The Saint John's Bible since the inception of the project. This event is part of the Braegelman Program in Catholic Studies Lecture Series.